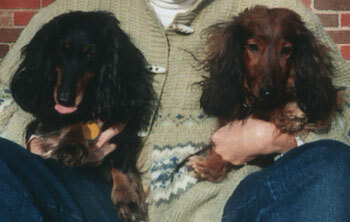 Here are my two long-haired dachshunds- Molly on the left, is 10 years old; I got her as a little pup when I lived in Phoenix. Doodad (the "Dood", my rescue guy, on the right,) is 5 years old. He came to me from Indiana last December. Well, well a matched set. They are pretty. HEY THERE I HAVE A LONG-HAIRED DACHSUND NAMED SWEET PEA. THERE ARE THE BEST!! I HAVE THREE DACHSUNDS ONE NAMED BRIDGETTE, SHE IS A STANDARD, AND GHIZZIE SHE IS A RED MINIATURE SHORT-HAIRED DACHSUND.